Setting up your own mail server never has been easier! 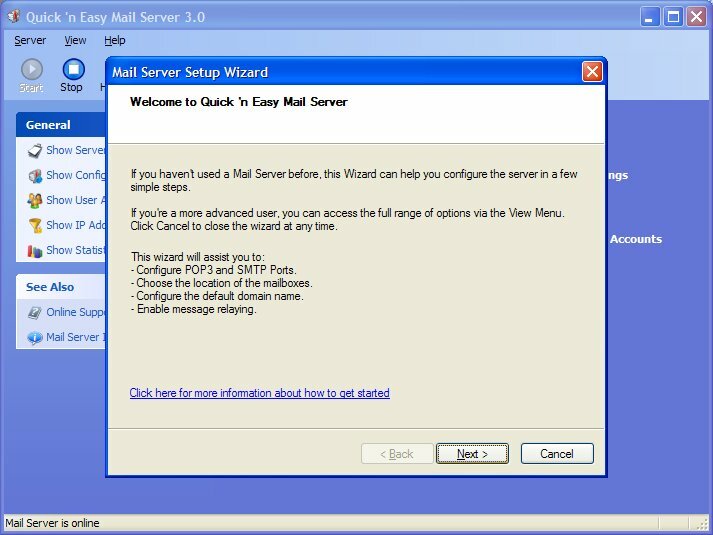 Quick 'n Easy Mail Server for Windows 98/NT/XP/2003 and Vista(32 bits) is a complete solution for users who what to run their own mini mail server. Use your favorite mail client (such as Outlook Express or Eudora) to send and receive email. Relaying messages using internal SMTP client with DNS support. Message relaying with the option to forward a specific domain to a pre-defined mailserver. Clear and easy user interface. Real time server log (can also log to a logfile). IP Filter to block/allow only specific IP addresses. Build-in Mail Server Setup Wizard. New: Mail Forwarding: forward mail for single users or specific domains (wildcards supported). Click here if you are interested in the MFC/C++ source code.